Provenance: Adda Family Collection, formed in Alexandria in the first half of the 20th century. Notes: This mosque lamp bears the name of 'Abbas Helmi II, the great great grandson of Muhammad 'Ali, who was Khedive of Egypt between 8 January 1892 and 19 December 1914. 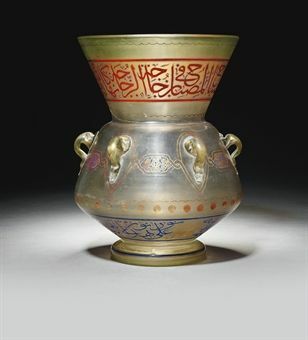 A similar mosque lamp, with the same date, the name of 'Abbas Helmi Pasha and an inverted but similar colour scheme is known in a private collection. The presence of two suggests a group commissioned for a particular institution. It is tempting to suggest that these mosque lamps were made for the Mosque of Al-Rifa'i on which work began in 1869. The first stage of construction came to a halt after the abdication of the Khedive Isma'il in 1880 but was resumed in 1905 under 'Abbas Helmi II who handed the task of completion of the monument to Max Herz Bey, the Hungarian architect in charge of the Committee for the Conservation of Arab Monuments in Cairo. It was completed in 1912, soon after the date found on this mosque lamp. 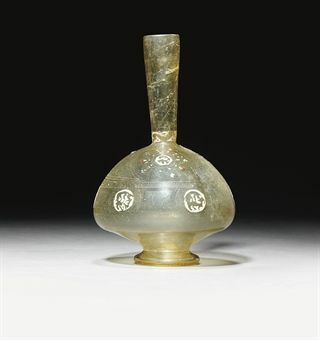 Chinese turquoise glass vase. qianlong four-character mark. 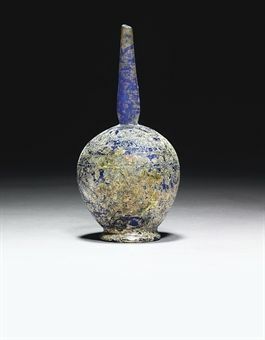 chinese turquoise glass vase. qianlong four-character mark.